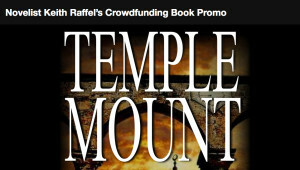 Hear the inside scoop on author Keith Raffel’s Kickstarter campaign for his fifth novel, currently in progress, Temple Mount. The practice of raising small amounts of capital from a large number of people to finance new business ventures started with the British rock band Marillion raising $60,000 on the Internet to finance a concert tour of the United States 15 years ago. Kickstarter, a leading crowd-funding platform, has launched 45,000 projects, involving 4.5 million investors and has raised more than $700 million. In the past year, crowd-funding platforms such as Indiegogo, Crowdfunder, and Pozible have mushroomed in the US, the United Kingdom and Australia. LitVote: How did your Kickstarter campaign go? Keith: Absolutely no complaints. The way Kickstarter works is you set a goal. If you make or exceed it, you get the money. If not, you get none. I set a goal of $18,000 and raised $18,746. Perfect. LitVote: What are the pros and cons of cloud campaigning — any do’s and don’ts or grains of wisdom? Using Kickstarter is like running a political campaign. When people donate to, say, Barack Obama, they feel vested in what he’s doing. I think Kickstarter supporters feel the same. They become advocates. There’s the sense of being in an adventure together. LitVote: Is there a recommended amount for authors raising money on Kickstarter? Keith: It’s a dangerous game. Ask for too much and you won’t get anything. Ask for too little and you won’t have raised enough to get the book published and launched. LitVote: Is there a particular season or timing that works best (for authors)? Keith: The key for me is reaching fans, friends, and family and asking them to support publication. Any 30-day period ought to work for that. LitVote: Where can we buy your books? LitVote: I wonder if people will stop/drastically slow donating once the target is reached. What happens when you aim too low and could have asked for more? LitVote: How long is the campaign? Keith: I chose to make my campaign 30 days. Shorter and there may not be time get word out. Longer and there would be no sense of urgency. LitVote: Do you get most of the pledges in the beginning? Keith: No. I received about as much in the end as the beginning. There was a lull in the middle. As the midnight hour approached, supporters wanted to make certain the campaign was a success. Procrastinators got their act together. Happy ending. LitVote: What’s the average pledge? Keith: $97. I had a few generous pledges that made that number skew large. The median was $50. LitVote: Did you lose sleep? Keith: Your darn right I did. The campaign started great. It ended great. But, as I mentioned, there was a scary lull in the middle. In one 6-day period only $70 was raised. The early birds had made their pledges, but others saw they had a couple of weeks to do so and they waited. Thanks goodness as the deadline approached, the money started flowing again. LitVote: How was the experience overall? Keith: Even before we kicked off the campaign, I was leery of hitting up people I know for support, but the experience has been more than positive – it’s been invigorating. Friends, family, and fans like being part of the adventure of publishing. One person I met at a book signing sent $400 to name a character. Another asked for nothing in return for a $1000 pledge; he said he just loved my books and wanted to support my writing. To my amazement 51 supporters signed up to edit the book. They paid at least $80 to have the privilege (ha!) of hacking away at my draft. Tom Sawyer had nothing on me! One high school friend made over 3,500 comments, suggestions, and edits. That’s more than 10 a page. Now, I didn’t use all – or even close to all – of the suggestions made, but I did use something from everyone. You can see where all this made me feel pretty darn good. LitVote: Will you use Kickstarter again? Keith: No. I’m following the advice of a Japanese proverb that goes something like this: “Every person should climb to the top of Mount Fuji, but only a fool does it a second time.” I have a feeling that my fans, friends, and family feel the same way. As counsel to the Senate Intelligence Committee, Keith Raffel held a top secret clearance to watch over CIA activities. He also founded a Silicon Valley software company, taught writing to Harvard freshmen, ran for Congress, supported himself at the racetrack, and worked for a DNA sequencing company.